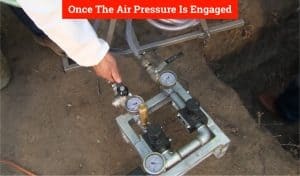 How exactly do you do underslab plumbing repair? 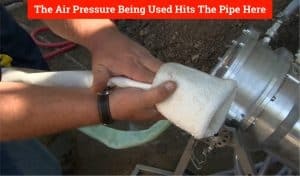 Tradesmen use a specialized machine and inspect and clean the pipe of debris. 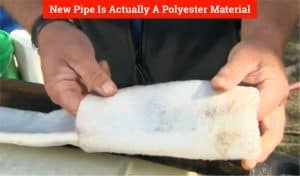 Then they feed a polyester sock like pipe down the existing pipes you already have. 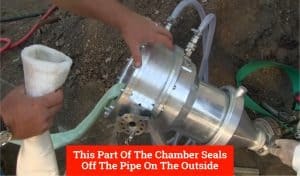 With epoxy and air pressure, a new pipe is set inside the old pipe in about 2 hours. It’s a really cool process and I am excited to show you each step down below. 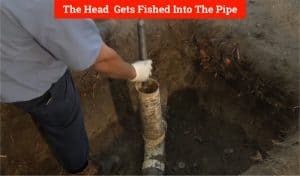 Are you ready to see why you don’t need a jackhammer to effectively repair broken pipes under the slab of your home? I know I am, so let’s get after it! Now I’ll start off by telling you this: the machines and material used here are all professional grade – so don’t even think about buying this on Amazon or at home depot. But the good thing is professionals can do this quickly and affordably – much easier than ripping up all your concrete for sure! Check out this article if you’re looking for some quick and easy plumbing repair tips. 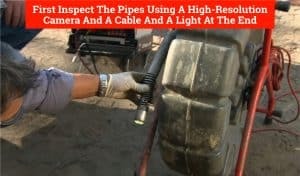 The first thing that needs to be done is to inspect the pipes using a high-resolution camera and a cable and a light at the end. 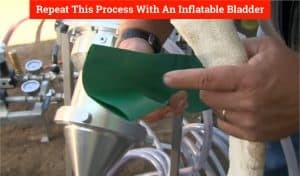 So – those are the major tools and materials used in this process and I bet you have a ton of questions. I promise I’ll show you the whole process and you will understand everything really quickly! Now let’s see how it all comes together. 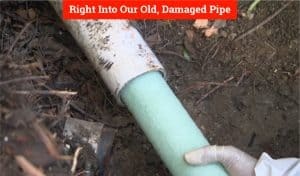 We first need to see how badly our pipe is damaged, and if we have any issues with roots that need to be cleared away. 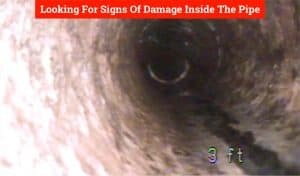 And you can see inside the pipe – looking for signs of damage. Notice on the left-hand side of the camera you can tell exactly where you are, in feet. That what you’ll know where there are problem spots. 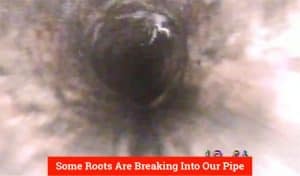 And see here where there is damage – some roots are breaking into our pipe! 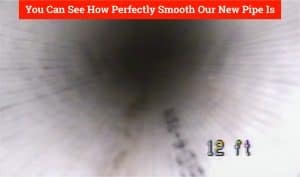 We run our camera through the whole length of the pipe to determine the extent of the damage. Once completed we can then run our cutter head down the pipe and clear away those pesky roots that have been causing all our problems. 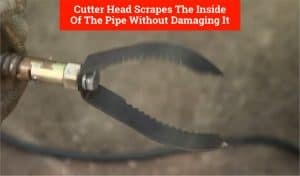 The cutter head scrapes the inside of the pipe without damaging it. The sharp teeth easily cut away roots that have found their way into our PVC or metal pipe. Once that’s complete, we can run our new pipe into our existing pipe. 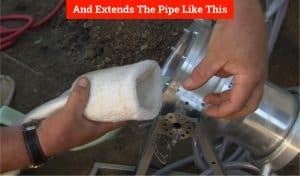 But you may be wondering “ How can a rigid pipe fit into our existing pipe”? Our new pipe actually begins its life as a polyester “sock”. Just think of it as a pipe, but flat. 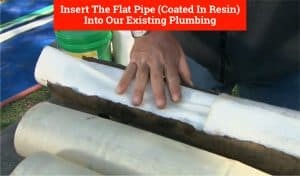 We will insert the flat pipe (coated in resin) into our existing plumbing, that way it can fit through all the twists and turns. 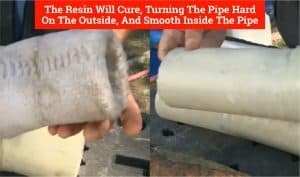 And the resin will cure, turning the pipe hard on the outside, and smooth inside the pipe. 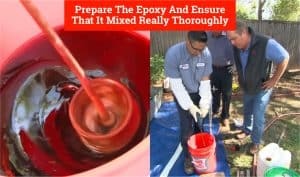 First, we prepare the epoxy and ensure that it mixed really thoroughly. 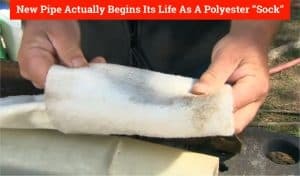 Once that is complete we pour the epoxy into our “sock” to prepare it. Once the polyester and epoxy are joined, we have about 45 minutes until it starts to harden. 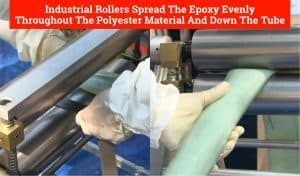 Then, industrial rollers spread the epoxy evenly throughout the polyester material and down the tube, ensuring every square inch is coated. And our machine makes this process possible. 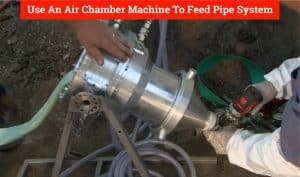 It’s a two-part machine consisting of air chambers. 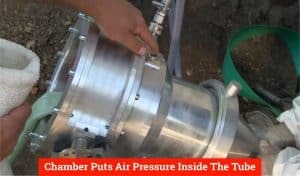 And this chamber puts air pressure inside the tube, to force it inside the existing pipe in your home. And our pipe is actually backward. 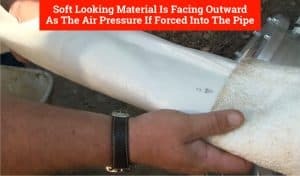 It unravels from inside out, so the soft looking material is facing outward as the air pressure if forced into the pipe. And that’s how we get our new pipe to sit in our old pipe, and this is the second stage of the repair. 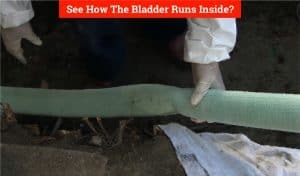 See how the bladder runs inside? 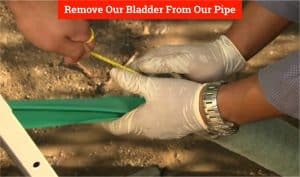 Now we use a different attachment that will run cold water into our bladder to inflate it to size. We will then switch the water over to hot water, and this will help cure the new pipe in place and make it rigid. 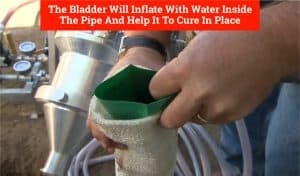 And once the hot water is run into the bladder it will take about two hours for our pipe to completely harden. And once this is extracted, we can inspect the pipe to make sure it is cured and there are no issues we need to fix. So we take out our trusty inspection camera and insert it back into out pipe again. And you can see how perfectly smooth our new pipe is on the inside. What a process for sure! I remember when you had to break up all the concrete to uncover a problem – the time involved, the cost and the mess… it was just crazy to think about it. Oh, and I almost forgot to mention, that water in my buddies house somehow leaked into a storage area, causing some mildew on his clothes. He found this article pretty helpful. 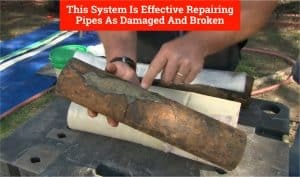 In this article, we showed you a new technique for repairing damaged pipes and completing underslab plumbing repair. 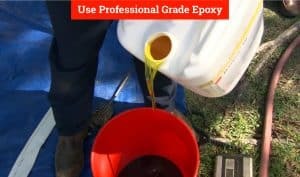 This method was such a time and money saver that I had to share it with you just in case you have this issue with your home. 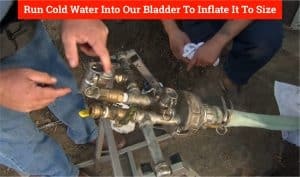 Now, most home plumbing problems you can handle on your own with simple repairs and knowing where key shut off valves are located – but every once and a while it really pays to call a professional in to handle a really big job where specialized equipment is necessary.